At the time of the Second Age of Serin, new races were created to fill its lands. One such race was made by Zafrin, and known as slith. It looked much like the lizards that made their home in the muddy swamps of northeast Serin, not far from the homelands of early giants. The sliths made their small homes in the same place, but left them not long after to adventure. 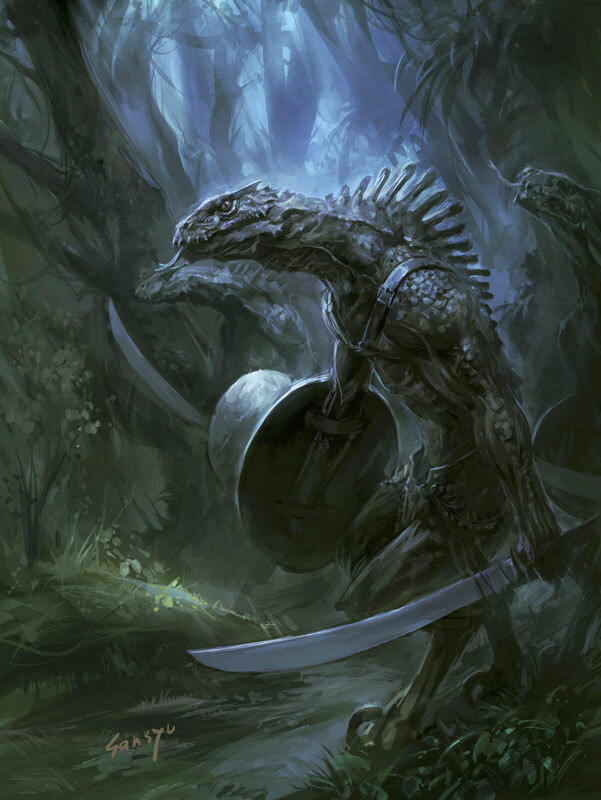 A sentient race of humanoid lizardmen, lacking the brute strength of their giant neighbours but agile on their feet, the foundations of a provisional slith society followed much later, though little interaction was ever made between these self-sufficient reptilian creatures. Their tribes divided, sliths found their ways to every part of Serin but remaining without a guarded settlement of their own. Present day sliths are often found adventuring by themselves, selling their talents to others that can afford their services. They rarely travel with others, even of their own race, a trait passed down from their cold-blooded ancestors. Sliths are natural wanderers, bringing them into contact with every guild in Serin, and their love for exploration has given them an edge in combat in the form of their tail, which they may use to fight with, as well as traits such as swallowing corpses and shedding their skin to make a getaway. However, their lack of want for association with other races throughout history has caused them to be lacking in spiritual and magical potential where others are not. It is for this reason that sliths restrict themselves to joining only the warrior guild. Use a sliths ability to shed his skin to escape dangerous situations or surprise an enemy into making mistakes.